Take exit 122 west from I-5. Go North on Berkley Street and go past the commercial gate 2 blocks until you get to Portland Avenue. Go through the traffic circle to the base gate. Follow the signs to the beach. Reservations are accepted up to one (1) year in advance. Allowed with usual leash and cleanup rules. 14 day stay limit on waterfront row. Some sites have 50amp electric. The maximum stay is thirty (30) days at any one reservation. If there is no waiting list or if space is available at the end of thirty (30) days, the user may make a new reservation for up to thirty (30). You must vacate the site for no less than three (3) days before starting the next reservation period. 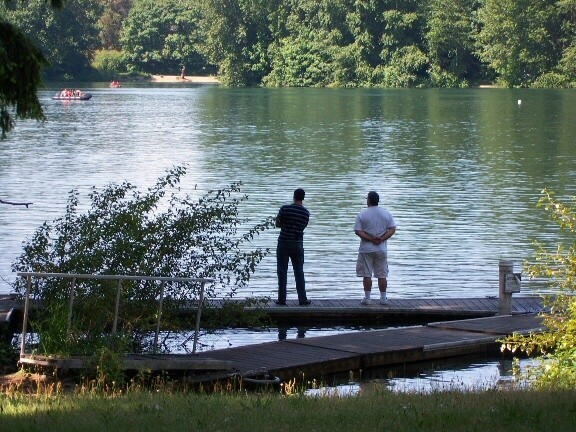 Although on the same lake as the Ft. Lewis Travel Camp, it is a separate campground. $5 fee for boat ramp. AUGUST 2018 We stayed on the waterfront row last August for 2 weeks. So peaceful and really beautiful. The prices have been raised to $25 for 30 amp and $32 for 50 amp. 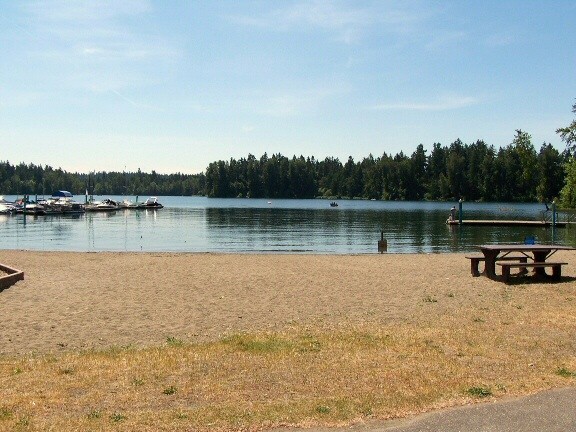 Still worth it for this gem of a campground so close to everything Tacoma and the surrounding area has to offer. 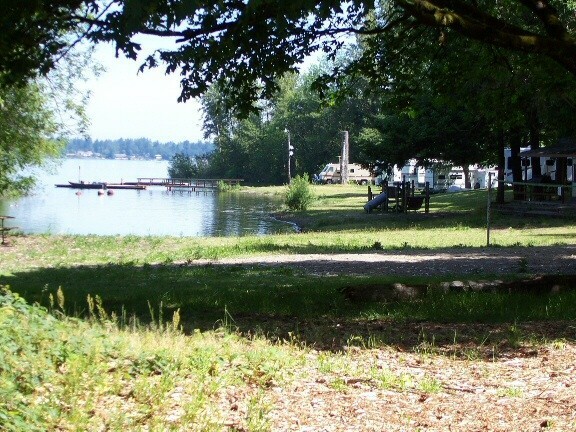 This campground is a gem! Quiet sites on and by American Lake, our site was on the upper row with a nice view and level gravel site. We were unable to extend our stay but would have liked to. Ray's Place on post had great coffee and a breakfast so large my wife and I shared it. 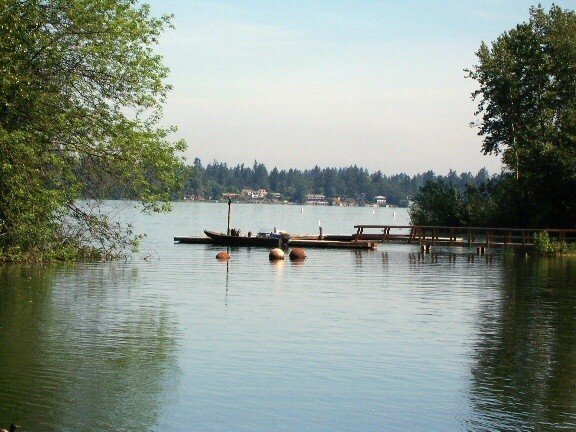 Great location and right on American Lake! Walking/Running trails, and a fresh water stream. 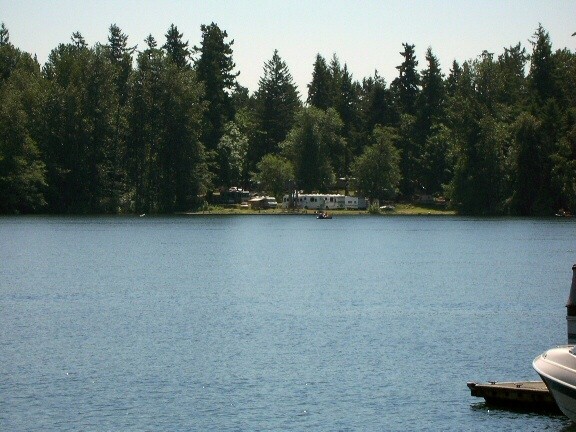 Stocked lake, and wild life abound. I will begin with a note about the gate. The directions on this site just say go through the gate right off of 5 however that gate is only open Mon-Fri and closes at 4. You must still Exit at 122 and go North on Berkley Street and go past the commercial gate 2 blocks until you get to Portland Avenue through the traffic circle to the other gate. Then once we got to the camp ground we never saw a camp host and never were told the codes to the bathrooms. We finally asked another camper the code to the bathrooms and the women shower smelled like feces. The lake was beautiful however I would not recommend this campground. Very quiet park with decent space to park your rig. Got reservations for two campers with just a days notice, we scheduled for 5 days but extended it to seven. 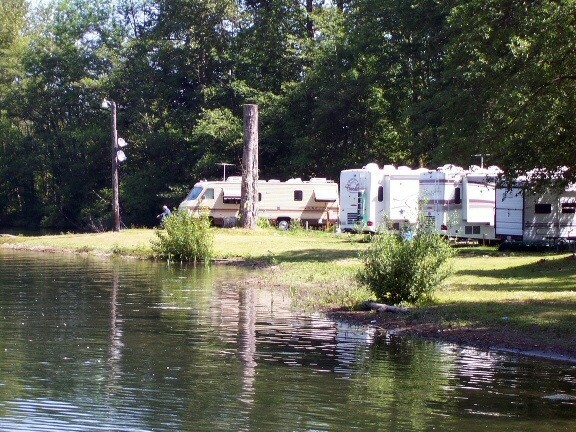 We had sites that backed up to the water and they had 30 amp service which worked well enough for our fifth wheel and for the travel trailer with us. The view of the lake was beautiful as was the view of the four eagles flying by constantly and diving in for fish occasionally. There are a number of semi-permanent residents but they were all friendly and courtesy. The rate is $20 per night which I considered good for a full hook-up and the base security seems to do an excellent job. A large number of satellite receivers are available for Dish and Direct TV users so the lack of cable is not a major issue for most. Our cell/wifi card worked well also, Sprint & Verizon. Getting to the combined base of McCord/Lewis is not a problem and they have all the things you would expect from a large base. 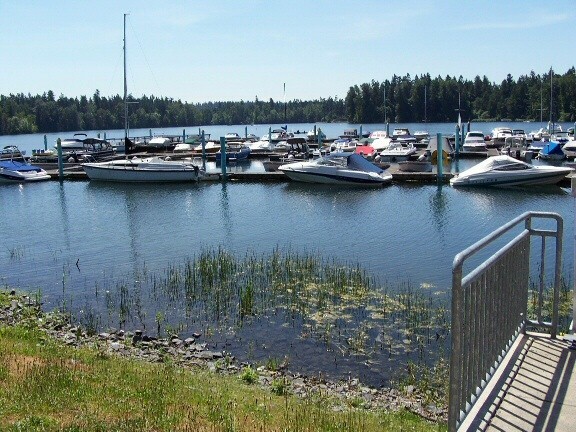 There are a couple of casinos nearby as well as the town of Lakewood and large city of Tacoma and Seattle. Overall this is a really nice CG and the camp host takes great pride in its' upkeep. Bathrooms, although not large, were very well cleaned and in good shape maintenance wise. I would definitely stay here again if in the area and would recommend it to anyone. R.L. left this review using the Directory software: The sites are not exceptional but overall it's a pleasant place. I don't recall if we had reservations or not but the host greeted us and directed us to a site. They were pretty full so we were glad to get in. The old Washington National Guard base has attractive old buildings and an interesting memorial park. We enjoyed the walking trail from the campground around the base. Access to the commissary at Ft Lewis is good. The camp is well located, away from traffic, nestled under the trees. Beautiful setting! Our site was on the back row with a lot of room behind us. Great place for a gathering of friends whom we hadn't seen in a while. I hope our experience was an abnormality, however: We made reservations by phone for two nights. Prior to our arrival, local friends checked on the reservations, and after some searching, the reservations were found and confirmed. We arrived at the camp about 4:45. There was no one in the office, the camp host was not there, and the assistant camp host was also missing. There was no posting on the door as to which site we should be in. After waiting about twenty minutes, we decided to take a vacant spot and hope for the best. About 5:30, the assistant camp host showed up, but he was little help. He couldn't find us on the reservation list, but said we could stay where we were for the night, but may have to move the next day. The next morning, the camp host was in the office. He told us we could stay where we were, and that he had come by the RV the night before about 7:30. At that time, we were out doing some shopping. There was no note on the door or anything to let us know our status. The envelope with the registration sheet in it was also supposed to have a list of camp rules in it. The registration asked for a signature stating that we understood and would comply with these rules. I refused to sign a statement saying that I understood and would comply with rules about which I knew nothing. The bathroom and shower doors had combination's, but we were not provided with the combination's until I asked. They were not on any of the printed information. There were satellites antennas all over; however, there was no indication as to which were Dish and which were Direct TV. This information also was not printed anywhere. When I did get the correct hookup, I still could not get satellite TV. Sites could have used a good weed whacking and the area needed a good cleanup. From the other visitors' comments, I'm sure we just hit them on a bad day. I certainly hope so. We arrived at the campground after 2000. It was dark and it was hard to see, but when we got to the office our name was posted as promised when we called to reserve a spot. When we finally got our TT parked and situated, the camp host checked on us to make sure that things were OK. That was really wonderful that he would check on us before he retired for the night. When we woke up the next day, we took some time to skip rocks in the lake, soak in some nature and just really enjoy our trip. 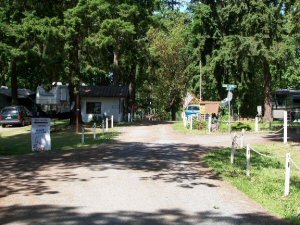 The place appeared to be very secluded, away from civilization, very serene, but it's actually minutes from Tacoma and even less to JBLM. Can't beat $14 for full hook-ups and even a Dish TV option if you have a receiver. We normally stay here when we are in the Seattle area. The park is very quiet and you normally can get reservations. 30 amps work well enough for our rig. The view of the lake for the "temporary" guests is great. There are a large number of semi-permanent residents but they are not allowed to stay on the lake for more than 2 weeks. The rate is good for a full hook-up and base security is excellent. A large number of satellite receivers are available for Dish and Direct TV users so the lack of cable is not a major issue. Our cell/wifi card worked well also. (AT+T/Verizon). Upon arrival, camp host was right there to assist as needed. I had site A 10 right on the lakes edge. Excellent site. The sites are very close together, but at this time of year, I had no one next to me. It is 30 amp hookup, but not true 30 amp. It is two 15 amp circuits together. I use electric heaters and tripped the breaker on one of the 15 amp twice. Had to be very careful not to use anything else electric when the heaters were on. Shopping was good with Ft. Lewis across the road and McChord within 5 miles. There was not laundry facilities on base, but close by in Tillicum. Overall, nice place this time of year because not many there except some that looked like they had been there forever. I think $14 was a little high for this place. It was close enough to do day trips to Mt. Rainier, Crystal Mt., and Seattle. MUCH improved since we stopped there last year. There were no spaces available so we didn't use the facilities but it looks like a campground now instead of a kinda scary south Arkansas style trailer park like it looked last year. We stopped here for a tent site in the primitive camping area. The sites were beautiful, set deep in a wooded setting. While inspecting the sites we noticed that they were infested wit ants. We declined all available sites for that reason. The location was fine, the host was very nice. He said he could not kill the ants because of the enviormentalists. We chose to continue onto McChord famcamp. Excellent, rustic campground. 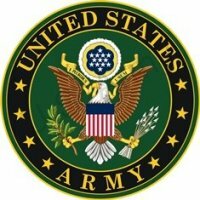 Laundry available and base amenities and nearby Fort Lewis or McChord. Quiet. Right on the Lake. Friendly host although not always available. Excellent place to stay right on the water, very quiet and cheap to stay! !